Since 2007, the use of renewable energy for transport has increased, because petrol and diesel suppliers are obliged by law to supply renewable energy. In 2015 and 2016, the share of renewable energy decreased, but in 2017 the share increased again to 5.9 per cent. It is laid down in Dutch law that suppliers of petrol and diesel for transport must supply part of the fuels as renewable energy. This mandatory share of renewable energy has risen from 2 per cent in 2007 to 7.75 per cent in 2017 (Staatsblad, 2014) and gradually increases to 16.4 per cent in 2020 (Staatsblad, 2018). This obligation is based upon the EU Guideline Renewable Energy (EU, 2009). In 2020, EU member states are obliged to use a share of renewable energy for transport which corresponds to 10 per cent of the total use of fuels and electricity for transport. The national obligation is set higher than 10 per cent as energy for transport also has to make an important contribution to the policy target for the total consumption of renewable energy (14 per cent in 2020). 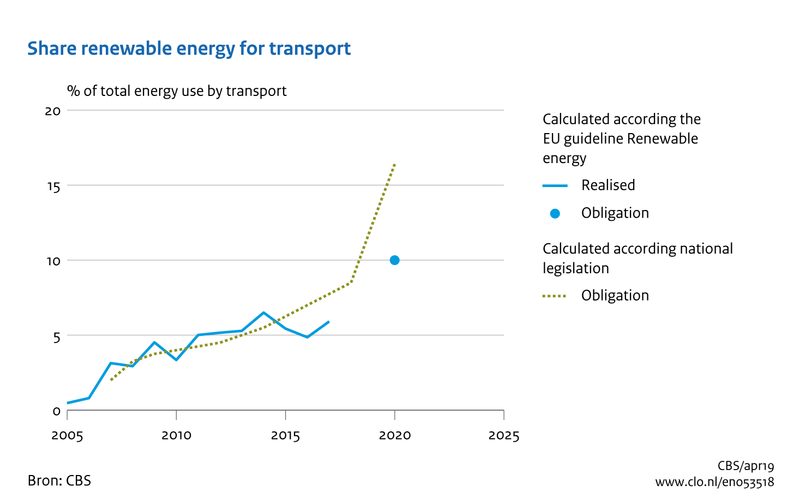 Due to differences in definitions, the realised share of renewable energy for transport according the EU Guideline is not always in step with the national obligation (CBS, 2017). In 2017, the actual share of renewable energy amounted to 5.9 per cent. In addition to biogasoline and biodiesel, green gas used for transport may also count retroactively for the calculation of the share of renewable energy for transport. The share of green gas in total energy consumption for transport is 0.2 per cent. Since 2007, suppliers of motor fuels for road traffic vehicles are obliged to supply these fuels with a certain percentage of biofuel. In practice, biofuel is usually blended (mixed) with normal petrol and diesel. This obligation is therefore often referred to as the 'blending obligation'. When calculating the share of renewable energy, environmentally friendly biofuels are allowed to be counted double towards the target set by the Dutch government. Today, such biofuels are very important. In 2017, approximately 50 per cent of biofuels were counted double, especially biodiesel from frying fat. There has been much public and political discussion in recent years about the desirability of using biofuels in road traffic vehicles. As a result of these discussions, the EU Guideline includes sustainability criteria for reduction of greenhouse gas emissions, reduction of damage to nature and respect for social rights. CBS (2018b). StatLine: Liquid biofuels for transport; supply, consumption and blending. CBS, Den Haag / Heerlen. Staatscourant (2018). Regeling Energie vervoer. Nr. 34392, 21 juni 2018. NEa (2018). Rapportage energie voor vervoer in Nederland 2017. Nederlandse Emissieautoriteit, Den Haag. CBS, PBL, RIVM, WUR (2019). Use of renewable energy for transport, 2005-2017 (indicator 0535, version 18 , 11 April 2019 ). www.environmentaldata.nl. Statistics Netherlands (CBS), The Hague; PBL Netherlands Environmental Assessment Agency, The Hague; RIVM National Institute for Public Health and the Environment, Bilthoven; and Wageningen University and Research, Wageningen.